Marquette basketball debuted a new app yesterday, luring users to download it by teasing a new Jordan brand shoe the team will wear on its upcoming Eurotrip. Being a people pleasing fellow, I took a screenshot of it and distributed it for public consumption, with a brief disclaimer that I wasn’t really feeling the new design. The response I received was in agreement and overwhelmingly negative towards the design. @CrackedSidewlks @PaintTouches The chicken looks a like a cheap counterfeit logo a street vendor would slap on a shirt to sell for $4.99. @PaintTouches I'm feeling …… nauseous ! The problem is not the shoe itself, I happen to think it’s quite classy and would be something I could see myself wearing often. The color scheme is subtle and it could be worn on or off the court. The problem is the logo. 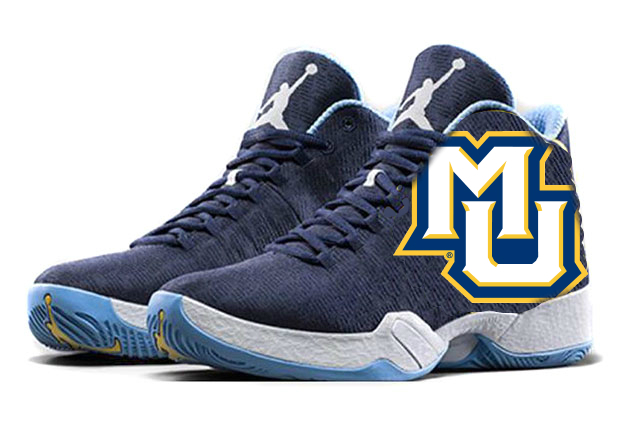 Yes, I know the XX9 features the oversized logo as its main attraction (Examples here and here), but no fanbase has as tortured a history with its mascot than Marquette. We won’t rehash that here, but it’s been over 20 years and a large contingent still doesn’t identify with the Golden Eagles, and even less with the cartoonish logo. So we put our Photoshop skills to the test and created an alternate design that would be much more palatable. Mr. Jordan, this one is on the house.